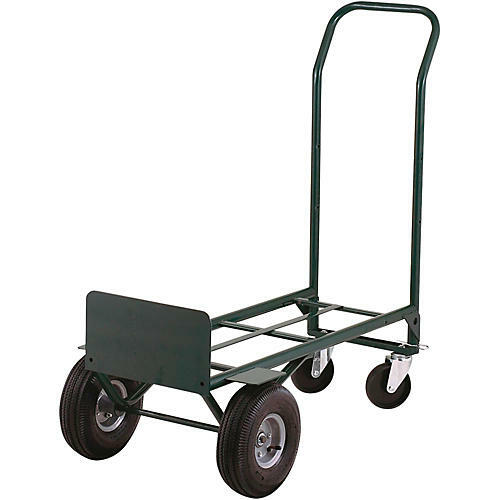 Harper's Super Steel 700 hand truck and is made to handle heavy loads. It is perfect for speaker cabinets, amplifiers, and drum kits with a 700 lb. horizontal capacity and a 600 lb. vertical capacity. The 10” all-terrain pneumatic tires, combined with heavy duty 5” swivel casters, provide for a smooth ride and easy maneuverability. The rugged steel tube construction of this truck, combined with its UV, and corrosion-resistant powder coat finish, make it highly durable. In the vertical position, the handle assembly can go from 50” to 64” for tall loads. The flow-back handle design allows for easy maneuverability in both positions.